The first clock of this design was custom-built for a person who wanted a dual time zone Nixie clock. Few places in the world have a time zone offset that's a fraction of an hour, so 8 digits are enough. The time shown here is 11:38:36 in the main time zone (the one that advances the date when it reaches midnight), 18:38:36 in the alternate zone. The offset between zones is adjustable from 0 to 23 hours, so they can represent whatever the user wants - local time and GMT, for example. The two hours displays are individually settable to 12 or 24 hour format. There is also an option to display only one time zone's hour, adding the tenths-of-seconds at the right. The clock can display the date in several formats, either automatically alternating with the time at an adjustable rate, or manually by pushing the knob on the front of the clock. Here's a back view of the clock. The red button at the bottom of the picture enters setting mode, and steps through the settable options. Turning the rotary encoder knob on front adjusts the selected option, turning the knob while pushed in adjusts in increments of 10. When not in setting mode, turning the knob adjusts the Nixie brightness. Click here for a copy of the clock's instruction sheet, in PDF format. The enclosure is a double baseball display case with removable glass top. It measures about 8" wide, 5" high, 4.5" deep. The Nixies are type ZM-1210 with the red tinting soaked off, making them effectively ZM-1212's. Here's a close-up of the circuit board. Visible near the middle are the clock's two ICs: a Supertex HV574 80-channel driver (in a 100-pin PQFP package - THAT was sure fun to solder! ), and a Microchip PIC18LF1220 (SOIC-18 package). The software uses 1284 of the PIC's 4096 words of ROM, and about 35 bytes of RAM. With the commissioning of a timepiece that would display both UTC and EASTERN hours the physical construction and design effort for the 8A-1 Nixie Clock was time well spent by the builder. Receiving said clock was redolent of timepieces created in the Sixteenth and Seventeenth century, where patrons would order the commissioning of one-off timepieces by Masters, and the end products were indeed unique. Having several instances of destruction in shipping by FedEx, there was indeed worry about the safety of the timepiece, but Mr. Harper's attention to detail, even with the shipping container, made it impervious to the rigors of shipment and it arrived in perfect condition, ready to operate. The glass case and wooden base make an excellent housing for the 8A-1. 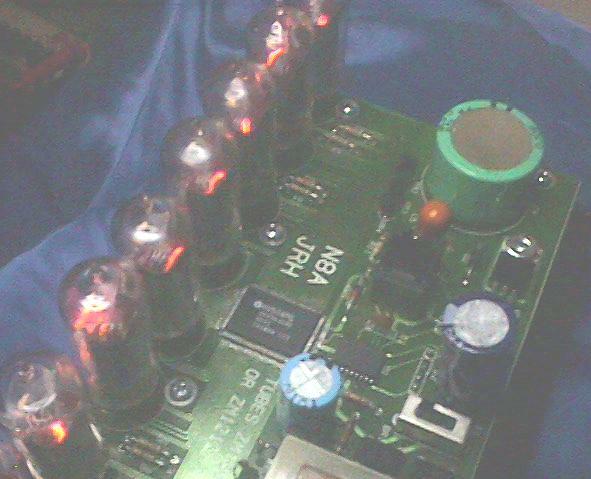 The builder uses metal pillars to raise the PCB to an aesthetically pleasing geometry within the plastic case whereby the umbilicus to the power supply and control componentry is at a minimum and hardly noticeable, and even when looking closely, the wire dress is tactful, with a minimum of lead length exposed. The builder uses a double-section microswitch to serve as a cover interlock, preventing inadvertent electrical shock should the workings be exposed. Under the base, the builder employs a metal shield against the wood, and supplants the clock circuitry with an EMI/RFI filter to block the clock's microprocessor noise from the a.c. line and to filter line transients from damaging the delicate circuitry operating the timepiece. The a.c. line cord is a grounded, three-wire variety to provide a drain for the noise the filter removes in both directions. 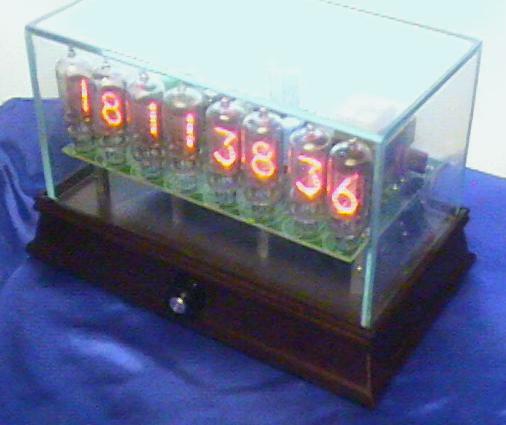 The clock programming, addressing the eight display tubes, leaves many options for the user. The dual-section hours may be programmed independently so that any two hours display can be entered, and the only interaction is the progressive hourly stepping of both once the clock is set to run free. Additionally, the clock will display a single hours registration, with minutes, seconds and tenths-of-seconds as just one of the programming options the user can easily set. The day-date-century-year display has numerous variations to suit owners who prefer the date in a unique fashion. The clock can be programmed to alternate between time and date with the duration of each display adjustable, or can be set so that a push of the front control button/dial yields the alternate display. 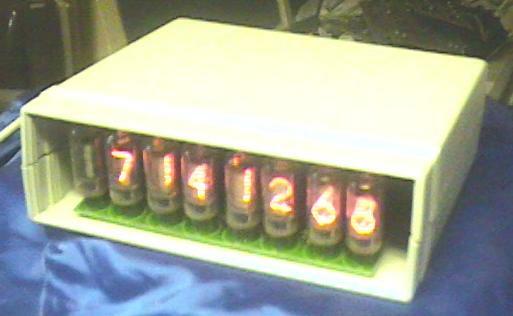 The clock display tubes, with the rotation of the front panel stepping knob/pushbutton, offer 128 brightness settings! The instructions coming with the clock are simple and straightforward. Unlike the setting of a VCR clock, there are no "secrets" involved, meaning one push of the programming button in back and a twist of the front knob chooses the options for each of the eleven categories. I believe this timepiece to be the finest of Mr. Harper's portfolio to date. 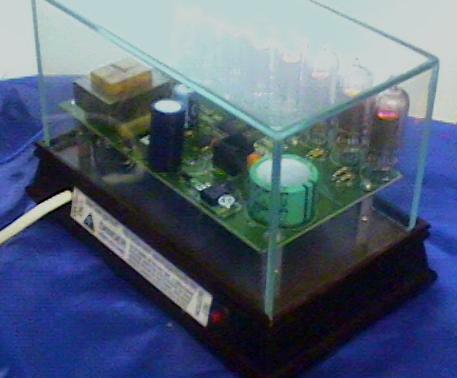 It matches and surpasses all the competition hands down, and is worthy of addition to the home or office collection of the most discerning patron..
Lastly, attached to the bottom base are two spare Nixie display tubes in original factory cartons, just in case. Here's a mockup of a possible simpler case design for future versions of this clock. It's the board from #1, sitting in a Hammond white plastic enclosure (of which I have two) measuring 8" by 2.5" by 7" deep. I'd just have to cut a piece of clear plastic for the front panel, and decide where to locate the controls.